Arnold, please tell us about how you got started in the money management business. 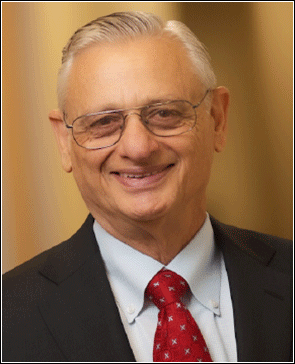 I began my investment career in 1968 at John Hancock Insurance and later moved to Capital Securities as I wanted to help clients save for their retirement. The year 1968 also happened to be the peak of the stock market. While the market experienced a bear market rally in 1970, its general trend during my first six years in the business was down, finally hitting bottom in 1974. This was the worst decline since the Great Depression, and as you can imagine, the mutual funds in which I had invested my clients’ money had also gone down dramatically. It was a very painful time for me and it caused me to rethink my investment strategy. I began to study many investment philosophies to try and gain a better understanding of why so many managers went down so much for so long. What I discovered was that value managers, such as Benjamin Graham and particularly his disciples, both protected their clients’ capital better and provided more consistent investment results than managers using other investment strategies. In addition, value investing resonated with me on a personal level as it was, and still is, consistent with how I live my personal life. So in 1974, at the bottom of the market, having finally found an investment philosophy I could believe in, I decided to start Century Management. At that time, I figured I was either going to make a lot of money or it was going to be the end of the world. Please describe how Century Management has grown over the years and tell me a little about your staff. Today, Century Management has 42 employees and roughly $2 billion in assets under management. My son Scott, who has been with the firm for 20 years, is the company president and chief operating officer, and my son-in-law, Jim Brilliant, who has been with the firm for 26 years, is our co-chief investment officer and chief financial officer. I continue to hold the role of co-chief investment officer and CEO. We have a very close family, so it has been great working with Scott and Jim over the years to build the business and manage the clients’ portfolios. But we have an entire team of very dedicated people working hard each and every day that make this company successful, and I am very proud of them all. They, too, are like family. As a matter of fact, CM’s average employee has been with the company for more than 11 years. This is an experienced team as well. Our average employee has over 19 years of industry experience. In concert with our company policy, every employee has the vast majority, if not all, of their taxable investable assets and 100% of their company pension plan assets invested in the same securities as our clients. Embedded into our firm’s culture is the belief that we should align our own personal investments with those of our clients. I have always felt that this goes a long way toward removing conflicts of interest, and it keeps everyone focused on doing what’s right for the client. Please tell us more about your private management versus your mutual fund products and strategies. Of our $2 billion in assets under management, approximately 88% of our business is conducted through the management of individual client accounts. Our clients are typically individuals and families with joint accounts, IRAs, and trusts; businesses with corporate accounts and retirement plans; and partnerships, foundations and institutional accounts. The other 12% of our business is conducted through the CM Advisors Family of Funds, of which we are the advisor. Our flagship private account strategy is our all-cap value strategy that we refer to as CM Value I. It dates back to 1974 and was the strategy I used when I started Century Management. However, over the years as clients expressed different investment needs, we applied our value investment discipline to a variety of other strategies, including two large-cap value strategies, two small-cap value strategies, three balanced strategies, and one fixed income strategy. Why do you believe that value investing is a better way to manage money? Value investing does not appeal to the masses. If it did, you would never be able to buy a bargain. Stocks selling below their intrinsic value or below what an experienced businessman knows his company is worth, bargain stocks, are usually only found during times of great uncertainty. Because of the fear surrounding uncertainty, many people are willing to sell stocks well below their intrinsic values and often times at bargain-basement prices. Typically this happens because a company, an industry, or in some cases the market at-large has a problem, which is usually temporary. Regardless, history has proven that investors who buy these bargains will frequently be rewarded when the uncertainty clears. This is as fundamental as it gets, and you can use this approach for any investment, whether it’s stocks, bonds, real estate, commodities, or a private business. As Benjamin Graham said, “Price determines return.” And, as his famous disciple, Warren Buffett, stated, “Uncertainty is the friend of the long-term investor”. What is your approach to value investing? Jim Brilliant, our co-chief investment officer, explains it best when he states that the main focus of our investment philosophy is to recognize and capitalize on value gaps. Simply put, the value gap is the difference between the price of a stock and the underlying value of the business. Benjamin Graham once said, “In the short run, the market is a voting machine, but in the long run it’s a weighing machine.” That’s exactly what he was describing. He was describing how in the short run, market gyrations move stocks all over the place, but the underlying value of the business is what defines the price over the long run. As an example, let’s take a cyclical company with a strong balance sheet. These are some of our favorites. We know at the bottom of the cycle, it generally loses or doesn’t make much money, at the top of the cycle it’s making a lot of money, and in between it is growing its earnings appropriately. 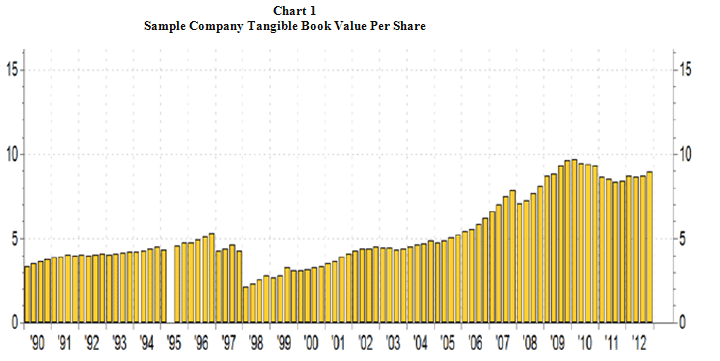 On Chart 1, I have isolated the tangible book value per share for our sample company, which is one of our favorite 14 valuation metrics that we use to value businesses. Tangible book value, for those not familiar with it, consists of all the assets of a company minus all the liabilities, which gives you the net worth or book value of the company. From there, you subtract the value of goodwill, patents, and copyrights, and what you have left is tangible book. Looking at Chart 1, you can see that while there have been ups and downs along the way over the past 20 years, the tangible book of our sample company has grown rather steadily over time. Now it’s cyclical, so there are some ups and downs. But, over 20 years, through all the economic ups and downs, the tangible book has grown pretty nicely over time. Now let’s look at the stock price during this same period on Chart 2. It’s volatile. It has gone from $5 to $25, back to $5, up to $10, down to $5, back up to $30, back down to $8, and so on. The value investor sees this volatility and says, “What a great opportunity.” However, the masses generally say, “This stock is way too risky, I’ll pass.” We are full believers in the “buy low, sell high” investment philosophy, so to us this would be a great opportunity. Now it’s time to apply our value gap methodology, and on Chart 3 we put Charts 1 & 2 together to compare price and value. What you notice on Chart 3 is that every time the price hits tangible book, it’s the bottom of the stock price. Furthermore, it doesn’t stay down there very long. This also coincides with the time that the stock is the cheapest and where the reward-to-risk is the greatest. Unfortunately, it’s also the time when the masses typically become fearful of the volatility, often times selling these stocks or ignoring them altogether, and thus give up the potential for a great opportunity. 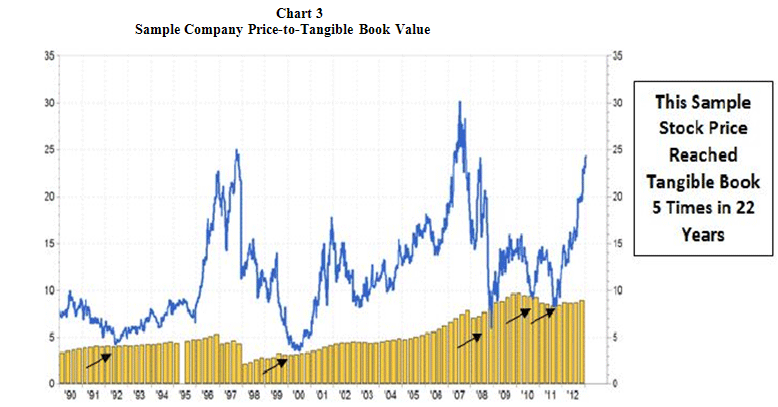 Now that we know the stock typically hits bottom when it’s selling at tangible book, the final step is to convert this into a price-to-tangible book ratio in order to see what this ratio has been at any time over the past 20 years. On the side of Chart 4, we show numbers zero through eight. The number one represents 1 times book, the number two represents 2 times book, and so on. 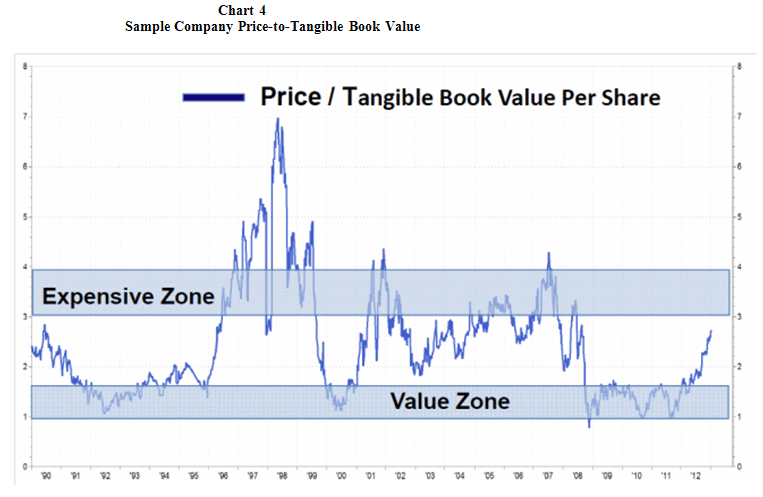 The Value Zone shown on the chart suggests it is a good buying opportunity when the stock trades at 1 to 1.5 times tangible book value. Conversely, any time the stock sells at 3 to 4 times tangible book, we would suggest the stock is in the Expensive Zone and selling is in order. When we wrap everything up, we put it into our valuation structure. In this example, we would set our worst case at 0.90 times tangible book, our buy point at 1.15 times tangible book, and our sell point at 3 times tangible book. While we use many valuation metrics to arrive at our total valuation, as certain valuation metrics are more relevant to certain companies and industries than others, we believe this process in valuing a business allows us the opportunity to capture the value gap and make the volatility work in our favor. Are there certain sectors or cap sizes that produce better value gaps than others? Value gaps happen in all industries and all sectors. They happen in small companies as well as large. They can occur one at a time or all at once in major market downturns. It is for this reason that I began Century Management with an all-cap value discipline, as I did not want to be limited to any cap size or sector of the market. I wanted to invest wherever I could find value. This all-cap value approach has been our flagship strategy for more than 38 years. As value investors, do you ever use macroeconomics? Yes, we review macroeconomic factors. However, we have come to the conclusion that there are only three primary drivers that affect stock performance. And although you won’t always be right, if you concentrate on these three things, your investment decisions, overall, will probably be very good. They are inflation, interest rates and the fundamentals of businesses. How would you describe the fundamentals of business today? There are many positive developments taking place in this country. While there are also a lot of short-term negatives impacting the economy, the positives have, unfortunately, been lost among the negatives featured in today’s newspapers. For example, there are tremendous opportunities and financial gains taking place in the production of natural gas. This is truly a game changer in economics, and it is truly phenomenal to see this happen. For the first time in our country’s history, we are going to be able to create a surplus in natural gas that will allow us to become a major exporter. Up to this point, we were only importers. We have the capacity to produce natural gas at $4.00 to $4.50 per thousand cubic feet. We can ship it for another $4.00 to $4.50. We can sell it as high as $16 in Japan and in Europe at $10 or $11. In addition, it is now estimated that we have a 100-year supply of natural gas, and its drilling and production is not expected to taper off for another 20 or 30 years. Because we are becoming the low-cost producer of natural gas, there is a manufacturing resurgence taking place in the United States. In fact, there are companies from all over the world planning to open up plants here to be able to take advantage of this low cost energy. One example, the irony of ironies, is that Egypt is bringing over their largest fertilizer manufacturing plant to the U.S. because they can buy the natural gas cheaper here than in the Middle East. This is truly amazing. Also in the manufacturing sector is 3D printing. This is one of the most exciting developments I have seen in a long time. 3D printing now allows manufacturers of any size in almost any industry to take a computer-designed blueprint, put it into the 3D printer, pour in a variety of liquids or other materials, and then the machine literally produces the product just like you would print ink on a piece of paper. As a matter of fact, in the field of medical science they have used this technology to make custom fit titanium jaws, as well as human skulls. Additionally, Wake Forest University is experimenting with this technology with the hopes of being able to reproduce human tissue, so that one day human organs, such as a kidney, can be reproduced. These are phenomenal developments that are going to make us, the United States, the low cost producer and manufacturer of many goods and services. As a matter of fact, our research shows that in order for Europe to be competitive with America today, they would need to reduce their costs another 30%. This is in addition to the reductions they have already made! Japan is no longer competitive with the United States; they are bringing their automobile plants over here, and they are starting to print money again to reduce the value of the yen. China, which used to be our main competitor, is still a competitor. However, because their wages have increased, all of the unrest, the shipping and so forth, there are many companies that are starting to bring their plants over here instead. Real estate is another area of growth for the U.S. While real estate markets and prices are location specific, the overall health of the U.S. real estate market has been improving. As the shadow inventory continues to be worked down, new home buyers and investors enter the market; and with the help of low interest rates and the lack of development over the past four years, real estate has become a tailwind rather than a headwind for the economy. These items make the long-term future of America very bright indeed. Do you expect high inflation in the near future? Over the last 10 years, commodities, in general, have moved up about 7%. Well, why hasn’t this 7% increase in commodities registered in the CPI, as it only shows a 2.4% increase? The reason is that the biggest cost of inflation is human labor. In any product, labor costs between 60% and 80%. And therein lies the rub. As your readers have probably noted in their own salaries, most have not gone up for the last five years. You will not have wage inflation until salaries go up. And when looking at a real rate of return (inflation adjusted), salaries aren’t even back to 2007 levels. For five years salaries have been stagnant. If the median income in the United States is $50,000, and people have to pay more for gas, but they do not have any more money coming in, they spend more for gas and spend less on food, on clothes or other things. Commodity prices will eventually average out as people spend more on energy and less on other things. As a matter of fact, the Continuous Commodity Futures Price Index hit a high of 700 last year, and it has been coming down just as gold has been coming down because the effects have already started to percolate through. So first of all, you’re not going to have as much commodity inflation going forward. Second, you are not going to have much wage inflation. Over the last year, we have averaged 180,000 new jobs a month. But there are 110,000 people coming into the labor force each month looking for jobs. So if you take 180,000 jobs and subtract the 110,000 people that are coming into the job market, the net job creation is 70,000 per month. In order to have a tight labor market in which people can negotiate for raises, we need the unemployment rate down to about 6.0% to 6.5%. That’s going to take approximately 4 million jobs. If you need 4 million jobs to have a tight labor market and wage inflation, and you are only producing a net 70,000 jobs a month, it will take four years and nine months to get that tight labor market. It is Fed Chairman Bernanke’s desire to move this money out of the banks during this time, which should be sufficient to stave off major inflation. Now whether he does it or not, I don’t know. But after reading the Fed minutes, I get a sense that there are many people on the Federal Reserve Board concerned and that they will want to eventually pull this money out of the banks. However, if they don’t, then those people who are predicting high inflation will be right. Watch what the Federal Reserve’s doing. If they start to remove those reserves, you can quit worrying about inflation until you have a tight labor market. Can interest rates go up even if we don’t have high inflation? Yes. Credit risk can cause a dramatic rise in interest rates if people begin to fear that they may not get their money back. Spain, Greece, Italy and Portugal had very modest inflation a couple of years ago, running around 2.5% to 3.0%. It was a little higher in Spain and roughly 4.0% in Italy, but pretty much like the U.S. Then, in a matter of weeks, Spain’s bond went from 4.5% to 7.0%. Greece went from 4.5% and 5.0% to 30%. Italy went from 4.0% to 7.0% and Portugal went from 5.0% to 20%. What caused their tremendous increases in interest rates if there was no inflation to speak of? They were so heavily in debt, and since the debt kept piling up because of the recession, people started worrying about getting their money back. So credit risk can drive up interest rates. Now I am going to give you the guidelines. In Spain, debt-to-GDP is 90%. In Greece, it’s 170% to GDP. In Italy it’s 127%, and in Portugal it’s 118%. The general thinking at the International Monetary Fund is that when a nation gets to be about 115% to 120% in debt, people start worrying about getting their money back. Today, the U.S. is at 103%. While we are not at the level of these other countries (except for Spain-however, our earnings power is greater and therefore our ability to repay our debt is greater), we are at risk when it comes to interest rates. It has nothing to do with inflation; rather people would be worried about our government’s ability to pay down that debt. I think it would take at least five to seven years, even at the current ridiculous rates, before people would start worrying about that. However, this is not a very long time, so we need to be thinking about it now. If the debt-to-GDP rises over 110%, then you must consider the risk of increasing interest rates due to credit risk as opposed to the increasing interest rate risk due to inflation. In the 1970s, the U.S. had a very low debt-to-GDP ratio. That’s why the Fed was allowed to continue on. Today, there is so much debt in the economy that it will weigh heavily on the U.S. if interest rates begin to rise. However, in the immediate future, I do not believe that interest rates will increase dramatically, nor do I believe that inflation will rise dramatically. As a value investor, how do you predict when to invest? Most of the people who have accumulated the greatest wealth in this business have done so not by predicting the future, but by buying companies at such attractive prices, thereby discounting the majority of the problems people fear. And, as usually happens in life and also when buying stocks, most of our fears are never realized. When investors own companies at prices that already reflect existing and future problems, as some of those problems never materialize, they likely find themselves with nice profits and thereby understand and appreciate that the greatest wealth is made in buying great values, not in trying to predict the future. Do you think the market is cheap or expensive today? 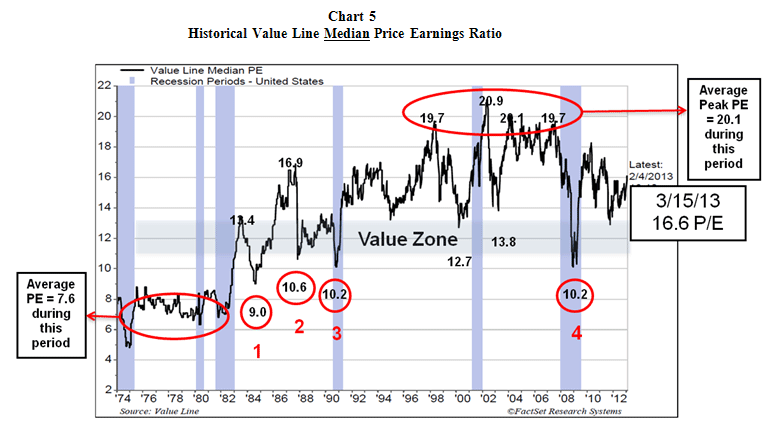 I think Value Line Investment Survey’s median P/E is a great barometer of the general market. 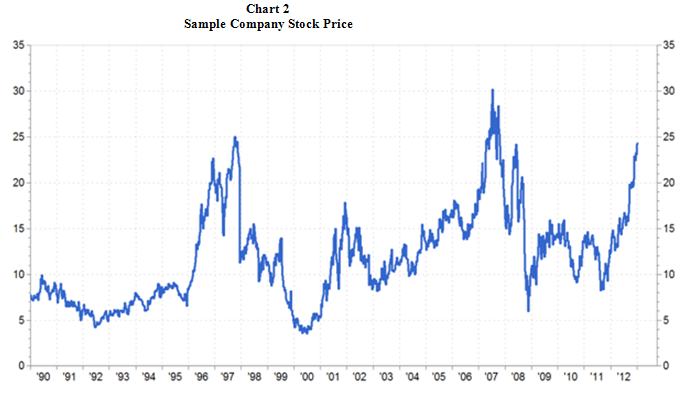 Over the last 30 plus years, this survey’s median P/E has fluctuated from about 10 at market bottoms to roughly 20 at market peaks. It is very simple and easy to understand. In 2009, when the market was way down, it was at 10 times earnings. Only four times in the last 30 years has it hit a median P/E of 10 +/-. Let me explain why this is such a good barometer to use. First, because it uses a median P/E versus an average P/E, the distortions caused by a small group of large companies, typical of an S&P 500 average P/E, have been removed. Second, it is made up of 1,700 companies versus 500 in the S&P 500 and only 30 in the Dow Jones Industrial Average, and it includes a lot of mid and small-cap companies. Third, it uses two quarters of forward earnings and two quarters of trailing earnings versus all forward-looking earnings. Therefore, I believe it gives you a very good evaluation of the general market. As of March 15, 2013, the median P/E is 16.6. If we currently had more normal, long-term historical growth rates, the potential upside could be from a median P/E of 16.6 to 20, which is 20%. However, I would suggest to you that because we have such slow growth in today’s economy, the median P/E probably won’t get over 17 or 18. If 17 to 18 is the peak given this current rate of growth, our opinion is that this is a fairly-valued market today with only 3% to 10% left on the upside. How can those interested in your services find out more about Century Management? You can learn more about our firm on our website at www.centman.com, or call us at 1-800-664-4888 and we will be happy to send you more information.